Fire Tech is known for teaching kids how to code, create video games, engineer robots and create unique objects using 3D printers. However, not everyone knows about our Digital Music Production course. This was hugely popular over the summer break and we’re also teaching it this December half term. Below, Will, a Fire Tech tutor, who teaches the digital music course shares what to expect during this class. I’m currently working as a freelance musician having graduated from the Royal Academy of Music this summer. I’m a drummer and composer trained in the analogue world but love using technology with my music to facilitate both the creation of sounds and to enhance my workflow. 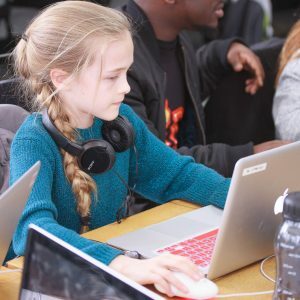 This summer I taught Digital Music Production at South Hampstead School in their fantastic, and recently rebuilt, building that creates a light and open space to work in. At Fire Tech we try and share our love for technology in a casual working environment. This is why I enjoy teaching for the camp, and I have been working here for four years. 2) What’s your best memory from teaching digital music this summer? Rotary drum kit, entire song with lyrics, breaking into the staff room to raid the chocolate biscuit box…it’s hard to decide! One imaginative team created a haunted house. We hung drapes from the ceiling, items for people to touch, and motion sensors all for triggering screams, bangs, organ chords and more as the poor visitors wondered around our house of horrors. 3) This video of you looks very creative what were you doing? Well this video is evidence of the mischief tutors get up to when the kids have gone home. Here we are messing about with the ‘finger band’ or ‘bandaid’ or ‘Elastoplast’ – we didn’t quite decide on a name. It is one example of the final day project that DMP campers get involved with. It uses skills they have learned through the week to turn the physical space into a gadget that controls sounds on their laptop. Tapping the foil pads, water, or grapes, triggers sounds in Ableton Live (the digital audio workstation or DAW that we use at Fire Tech). The sounds are triggered by completing a circuit and translated into keyboard signals using a Makey Makey. Fun hey! 4) What makes the Digital Music Production course so exciting? Imagine that tomorrow you have the opportunity to go fly a jumbo jet. Yeh, one of those huge Boeing 747 type things. All you have is a flying fanatic at your side occasionally explaining what the buttons and lights do. You’re gonna take a few nose dives and head off in the wrong direction, but basically you’re going to learn how to operate the thing pretty quickly. Now that’s exciting. Get rid of the flying metaphor and basically the kids are let rip on one of the music industry’s leading software programmes. So back on planet Fire Tech Camp we replace the plane with a Macbook Pro, the cockpit with Ableton Live software, and your navigation system with the child’s imagination. Campers can pretty much go where they like. 5) Coming to camp for the first time can make you feel nervous, how do you support campers? Ohhhhh yes! I remember this so well from attending music camps myself. We empathise and therefore try our best to get kids to play together and share their ideas. On the Digital Music Course we assume kids have signed up because they like music, so what better way to get started than chat about something you love. So the first thing we do is play this music to each other. Kids make musical associations with their new classmates and that helps to remember names. It’s a voyage of discovery for everyone. Also classes are kept to a maximum of eight, and we encourage peer to peer support. To book our Digital Music course click here. Fire Tech is the UK’s leading provider of tech courses for 9-17 years olds. 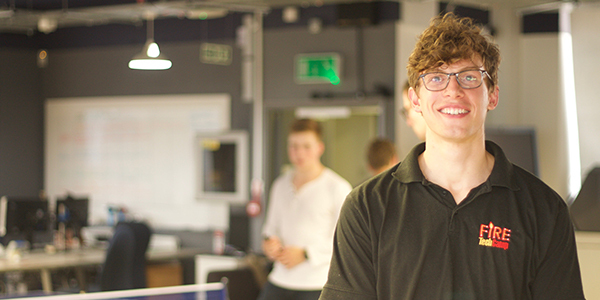 To date we have delivered more than 7,000 classes across the UK, EU and Australia. This December break we have a range of 1-5 day camps in London and Cambridge. Visit our course page to find out more.